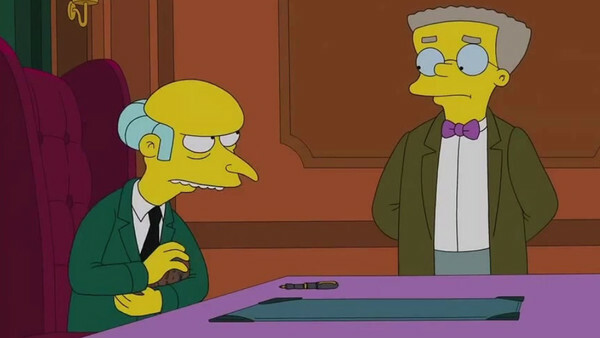 Mr Burns Or Mitt Romney Quiz: Who Said It? Over the years The Simpsons has made many characters who have many similarities to real people, whether intentional as an influence or just as a happy coincidence. Some influences are obvious such as Rainier Wolfcastle's being Arnold Schwarzenegger, Otto's being the Guns N Roses Guitarist 'Slash', and Mayor Quimby being influenced by the ex U.S. president John. F. Kennedy to name but a few. Coincidentally with a cast range as large as there is for the population of Springfield, there will be unintentional similarities between characters and they could arguably work out even better for it. This benefits the show in means of comedy and character progression over time which would help the longevity of a series such as The Simpsons which has survived for 30 years and is still going strongly. One of the unintentional similarities falls between the infamous owner of the Nuclear Power Plant Montgomery Burns, and the US politician and businessman Mitt Romney. Can you tell who said what? 1. I Tasted A Beer And Tried A Cigarette Once, As A Wayward Teenager, And Never Did It Again.